Time 4 Tutoring offers tutoring in any of these areas of mathematics, and more. 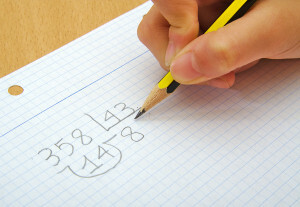 Pre-Algebra – T4T students will be assisted in reviewing the mastery of fractions, decimals, percentages, statistics and problem solving skills, as needed. Algebra I – Algebra 1 tutoring is designed to provide students with further study in linear and quadratic functions and graphing. Teachers will be available to assist students in solving equations and inequalities and applying these skills to other areas of math, including word problems, ratios and proportions. Geometry – The T4T geometry-tutoring program element is set up for students who require review in the study of the properties and applications of common geometric figures in two and three dimensions, including the study of transformations and right angle trigonometry. Inductive and deductive thinking skills as used in problem solving will be emphasized. Assistance will also be available in reviewing the process for writing proofs to solve properties of geometric figures. Pre-Calculus – For students requiring a review of topics in Algebra from polynomial, rational and exponential functions to conic sections. Tutoring is also available in the areas of basic trigonometry concepts, analytic geometry and calculus concepts including limits, derivatives and integrals. Calculus/Basic – For students who need further study and review related to exponential and integral calculus of a single variable, with a review of introductory multivariable differential calculus, emphasizing applications in business, economics, and the social sciences. Trigonometry – Tutoring will include a review of relations, functions, graphs, polar coordinates, complex numbers, limits and derivatives. Assistance is available in the analysis and graphing of mathematical functions and verification of trigonometric identities using all of the basic trigonometric identities.